Comté (pronounced con-tay) is a cheese made using time- honored traditions of the Franche-Comté region of France in the Jura Mountains bordering Switzerland. The terrain is rugged but also characterized by plateaus with lush green fields, allowing for the production of this "mountain" cheese. 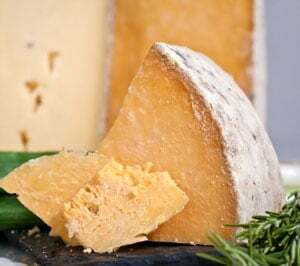 Comté is not only a world renowned cheese with subtle aromas prized by gourmets internationally, it’s first and foremost a valuable foodstuff—wholesome, natural and an essential ingredient in achieving a balanced diet. The outstanding nutritional quality of Comté is the result of the traditional manner in which it is produced, in rhythm with nature and the seasons. 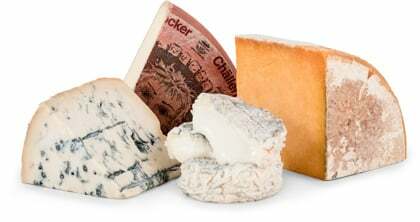 The main characteristic of the cheese is its exceptional aromatic diversity. In 1993, a professional tasting jury identified more than 200 aromatic components in Comté. It’s not necessary to be an expert, however, to appreciate what a surprising experience tasting different Comtés can be. One young Comté may exude a distinct odor of fresh hazelnuts while another will reveal a discreet touch of nutmeg. A young, 6-month old Comté will bring to mind the delicate smell of buttery mashed potatoes while an older, more patiently aged specimen like the one we have shipped you may surprise with its cascade of fruity, spicy, and roasted flavors that unfold gradually and last on the palate. Each Comté has its own unique aromatic and unpredictable perfume. Their exceptional diversity can be attributed to a couple of different factors. The first is connected to the diversity of the land itself. The apparent unity and geological and historical coherence of the region do not detract from the variety of the soils, and the microclimates and flora naturally create what could be called "cru" just as it is in the world of wine-making. In the heart of the Jura massif, the old folk are capable of distinguishing the dairy where a particular cheese was made. The second factor is attributed to the duration of the maturing period which enables nature to unfold its divine alchemy at a leisurely pace. Thanks to its uniqueness, its cultural importance and its economic contribution to the region, Comté cheese was one of the first cheeses to be awarded a label of origin guaranteeing its quality (AOC). All Comté is graded using a 20 point grading system. A green label denotes "Comte Extra" and ensures the cheese has been graded 15 points or higher. This is the Comté you are receiving with this month's selections. As one of the premiere cheeses of France, we know you'll enjoy this fine taste of French living. Bon appétit! All Comté is graded using a 20 point grading system. 15 points or higher denotes a labeling of "Comté Extra". We found it salty, mild, and lightly fruity with hazelnut and nutmeg flavors. This cheese works well in a fondue, as part of a cheese platter or in a hot, melted sandwich. It's also suitable for snacking or tossed as cubes in a salad.